The number one financial goal most people have is to build (and spend!) their retirement account. 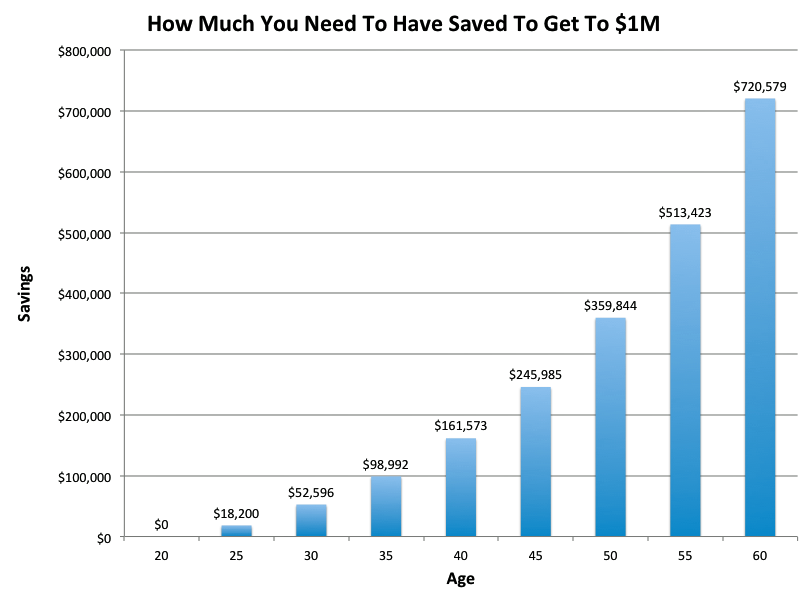 If you wanted to retire with $1 million in the bank by age 65, do you know how much you need to have saved? This chart below shows how much you need to have already saved by a certain age, assuming a 6% annual rate of return with a monthly contribution of $400 dollars. So if you are 20, you can start with zero as long as you start socking away $400 dollars a month and get at least 6% a year. When you hit 65, you will have $1,113,851 saved up! Meanwhile, if you are 40, you will need to have at least $161,574 already saved up, and if 55, you will need $513,423! Obviously if you can save more and get a higher rate of return, then you don’t need as much saved up. What if you can put more money in per month? How much money would need at your age to hit the million? The chart below shows the different monthly amounts (on top line) you would need at a given age (on the left). Under the same circumstances with a 6% annualized return, a 40 year-old would only need $99,179 if he or she put in $800 a month. 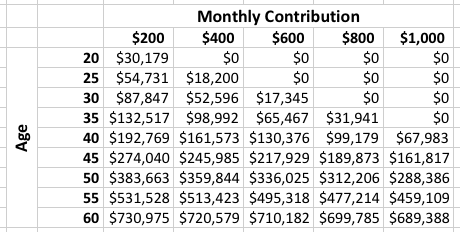 A 55 year-old also putting in $800 a month would need $477, 214 instead of the $513,423 in the example above. While putting in more money is important, it can’t make up for the loss of time. We figured out above that if a 20 year-old put in $400 a month until age 65 with a 6% annual return, he would have put in $216,000 in total dollars and would have just north of one million at $1,107,909.03. If someone else started at age 30 instead and put in $600 a month, they would have put in $252,000 in total dollars, $36,000 more than the 20 year-old, but at age 65 would only have $859,100.31, a difference of $248,808.72! That is how powerful time is when it comes to compound interest! Even if the 30 year-old got 8% instead of 6%, and was putting in $400 dollars a month, at age 65 he would have only $923,670.02, $184,239.01 less than the 20 year-old. You can control how much you put in and use SMART Investing Tips to maximize your returns, but you can’t control or get more time. This is why investing as early as possible is important for your retirement! Even though the best time to invest may have been in the past, the second best time to invest is today, so don’t delay! On average, people who delay and procrastinate saving and investing by ten years lose half of what they would have had. Here are more tips to follow for retirement!